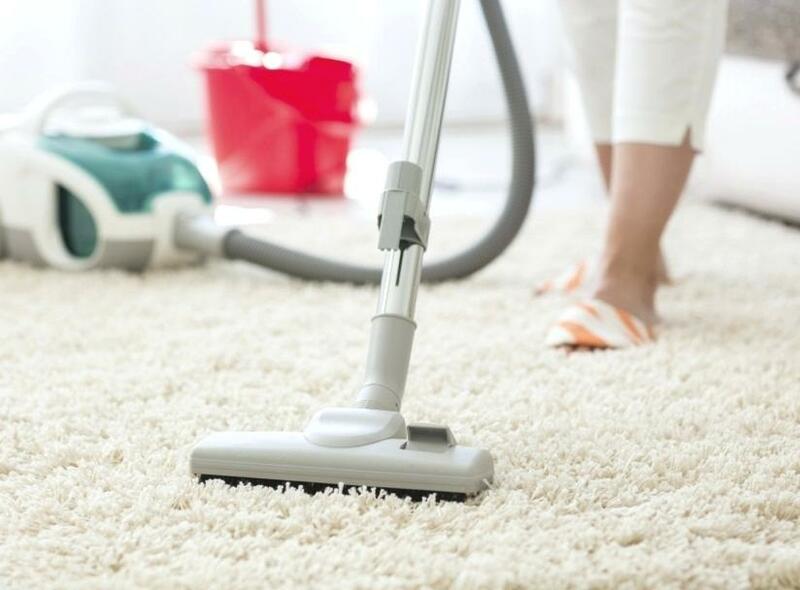 When it comes to gracious living, furnishing the interior of your home is only half the job. Living in a climate where at least four months of the year are spent under a blanket of snow, it sometimes seems a rather fruitless endeavour to weigh as much consideration on what goes outside as what stays in. 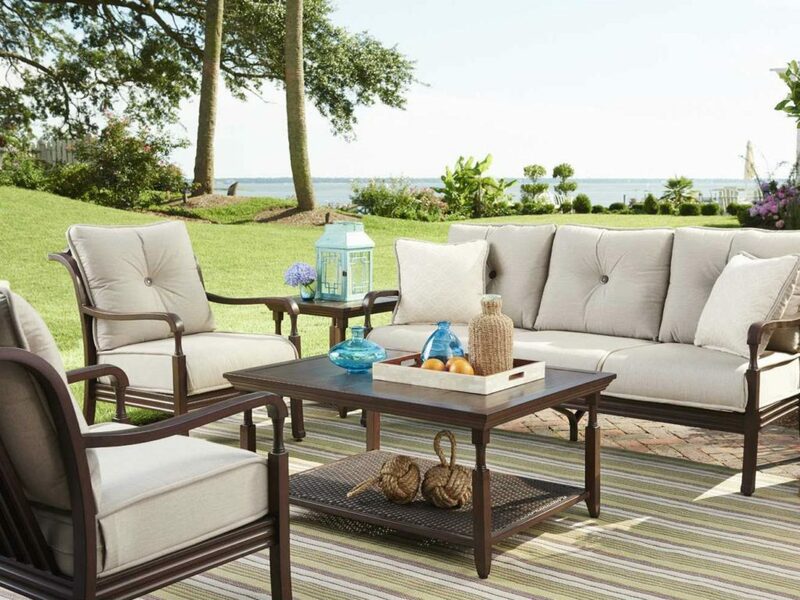 But patio furniture is a great way to extend your living space beyond those artificial boundaries (windows/doors) that keep the cool air in (at least in the summer) and the hot air out (vice versa in the winter). Okay, so maybe there is very little you can do to spruce up a snow and icicle-covered wood, cement or brick patio. But there is an awful lot to be achieved once these elements have receded and the warmth of the spring and summer sun brings forth nature’s glorious bounty for its yearly celebration. Furniture exposed to the elements requires special consideration. Patio furniture is about a lot more than a couple of Adirondacks pointed at the horizon and a knitted hammock tied between two mature, lazily-shading trees. Not that there is anything wrong with that. I love a good Adirondack. Ditto for the hammock. But patio furniture truly is a world unto itself; or, if you prefer, the Bizarro-land flipside of furniture designed to stay indoors. Furniture exposed to the elements requires special consideration. So, it stands to reason choosing the best material to withstand fading and damage is a matter of prudence and educating yourself on the various materials gone into patio furniture design. Dare to compare price, durability, and, inevitably, aesthetic value. Different elements equate to different pros and cons. For example, while stainless steel may provide superior durability, the weight of such pieces is not conducive to being easily arranged. So, if you are the type of person who gets bored easily, or likes to putter by constantly rearranging things…then, perhaps stainless steel isn’t a great option. Conversely, plastic patio furniture is lightweight; easy to move, though not that great in a windstorm…even a strong southerly breeze. Synthetic resin and teak always get top marks for their aesthetics and comfort; but each requires due diligence to keep them looking sharp and functional over time. Aluminum construction is preferred to plastic – more expensive too, but just as lightweight. Again, not so great in a windstorm. 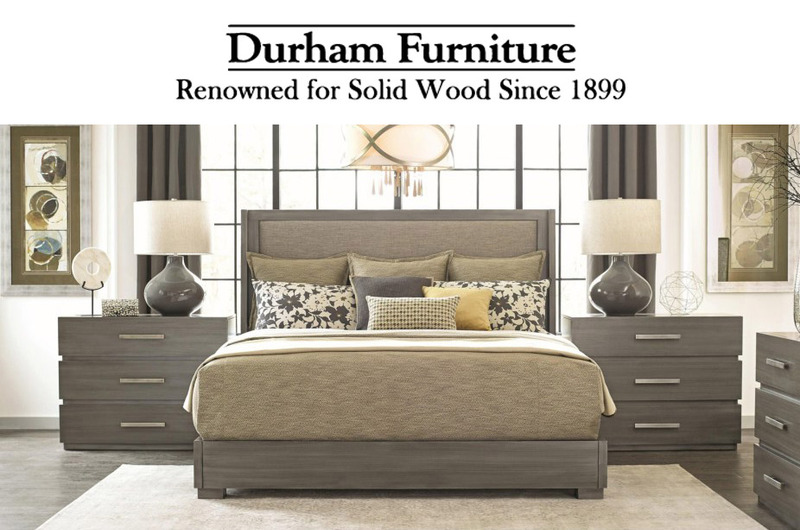 So, if you live in a part of the country where strong coastal breezes are an issue, you will want to look for furniture made of more substantial materials to bear up. Consider that synthetic resin ‘wicker’ furniture generally gets confused with rattan. But the similarity ends with synthetic resin’s wicker weave mimicking the beauty of rattan, but with exceptionally low-maintenance. It’s also lightweight and highly durable. 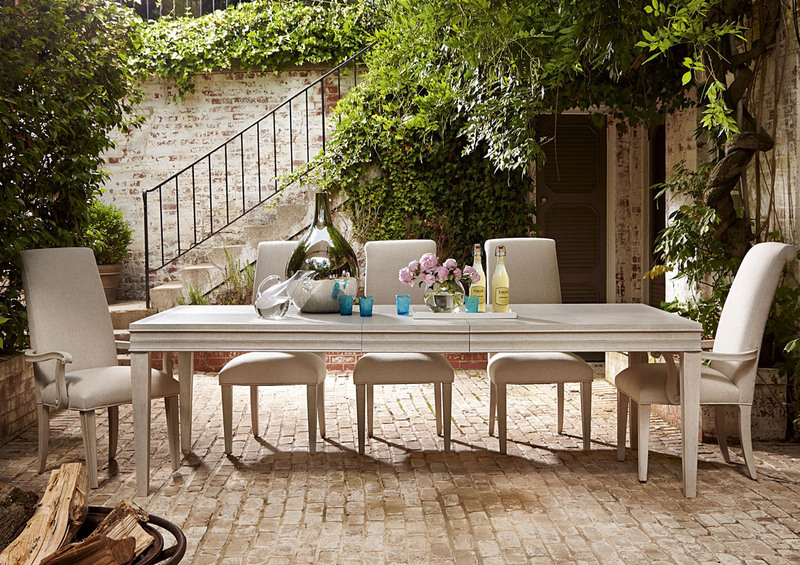 High-density polyethylene synthetic resin is, in fact, one of the best materials for outside furniture; head and shoulders beyond traditional PVC that can – and usually does – unravel or become brittle and crack under the sun’s scrutiny. 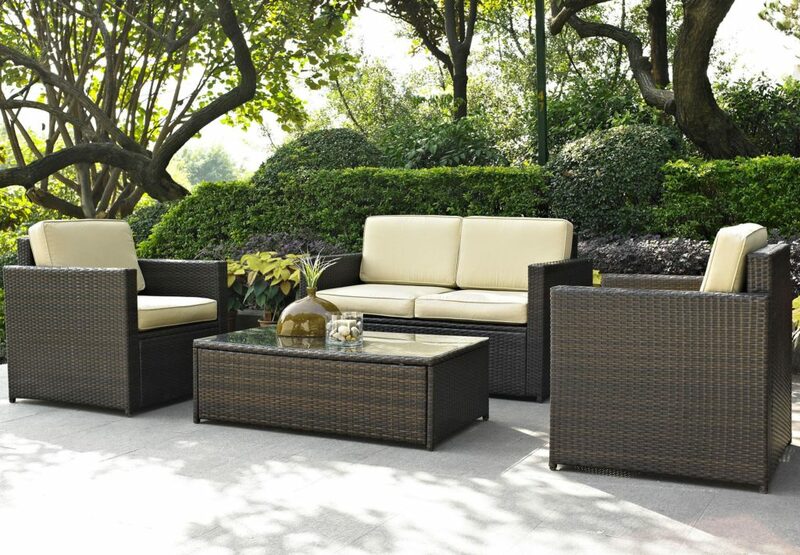 Best of all, synthetic resin wicker is exceptionally easy to maintain. Usually constructed on a commercial grade aluminum frame, synthetic resin is a crowd-pleaser, eye-catching and luxurious at a glance, while providing hours of lightweight and low-maintenance comfort for years to come. For the more rustically inclined, teak remains the ‘go-to’ wood. Teak’s petrified hardwood strength and exquisite grain patterns makes it unique to other types of naturally occurring woods. You can get up to fifty years out of teak; rather impressive when compared to its pine and cedar alternatives. Its smoothness makes it very appealing for tabletop surfaces, armrests and chairs. And, despite being a wood, teak is very moveable while still able to bear significant weight. But be forewarned: teak requires a lot of maintenance to keep it fresh and vital. You do not want your teak to turn silvery or otherwise discolor. As with all woods, teak is susceptible to rot, mildew and mold: the ravages of dampness from nature’s moisture. 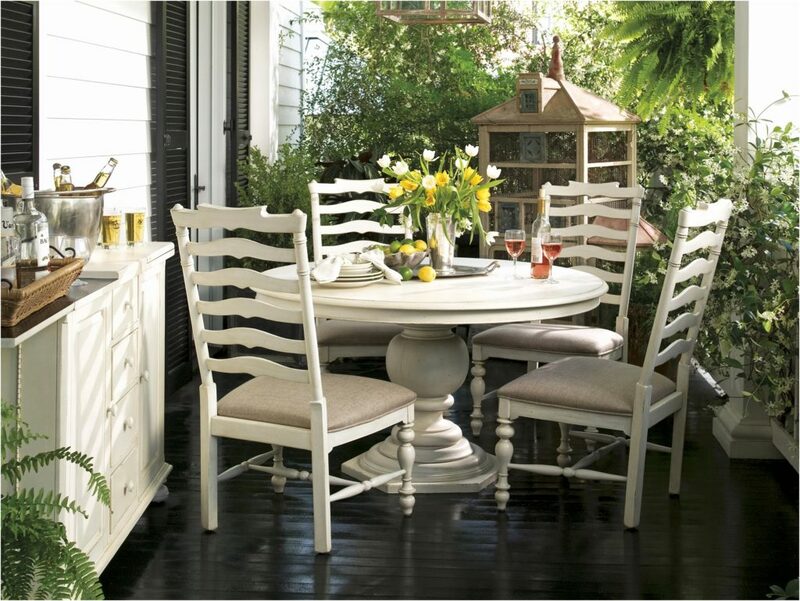 The rest of the outdoor furniture catalog is primarily derived from metal-based alternatives, beginning with the most historic of the lot: wrought iron. Since the mid-1800’s, wrought iron has been incorporated into the design of park benches, lamp posts and other outdoor furnishings. Once reserved for the uber-wealthy or municipal applications, wrought iron today maintains something of its time-honored status symbol; ‘wrought’ – translating into ‘wrought by human hands’, and therefore attesting to a unique level of craftsmanship, as compared to ‘cast’ iron, employing hot liquid metal merely poured into molds. Wrought iron is fairly weighty, implying a level of permanence. Over the years, the design philosophy for wrought iron has stayed pretty close to its roots; caught in a Victorian time warp with a sort of aged and ornate texture and design that harks all the way back to the turn of the century when life had a more even cadence. By contrast, steel (or iron mixed with carbon) is the strongest, heaviest and most expensive metal. While resistant, steel is not impervious to rusting, particularly if not properly coated. 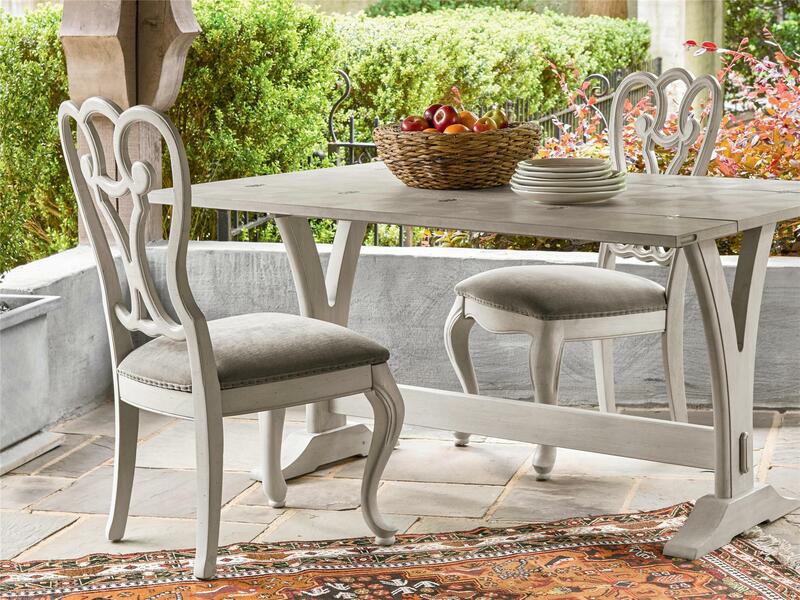 And because it is the weightiest of metals, it is also rather impractical for outdoor dining chairs or side tables that are expected to be relocated often. Which brings us to the best alternative of them all; lightweight and durable cast aluminum. While aluminum patio furniture may not be a great choice if you live in an area where frequent high winds are a concern, on the whole, aluminum’s durability remains unsurpassed; virtually impervious to rust and easy to manipulate in whatever layout your fickle heart desires. To be certain, there are other materials from which patio furniture is being made. But honestly, it is a question of ‘getting what you paid for’ or rather, ‘more hassle than they are worth’. Plastic resin, as example is the cheap alternative. But it is also flimsy and fragile. If you are truly stuck for extra party seating for an outdoor barbeque, then perhaps plastic resin will suffice in a pinch. But its neither a safe nor attractive alternative to the aforementioned choices. So, pass – and be very glad that you did! Other materials to avoid include PVC wicker, oft mistaken for its high-density synthetic resin counterpart because it can look virtually identical in a showroom, before nature’s elements have their way. Herein, read the label before buying. If PVC appears anywhere, its time to shop elsewhere. Finally, be wary of bare metal furniture. It will rust within a season and be useless to you thereafter. 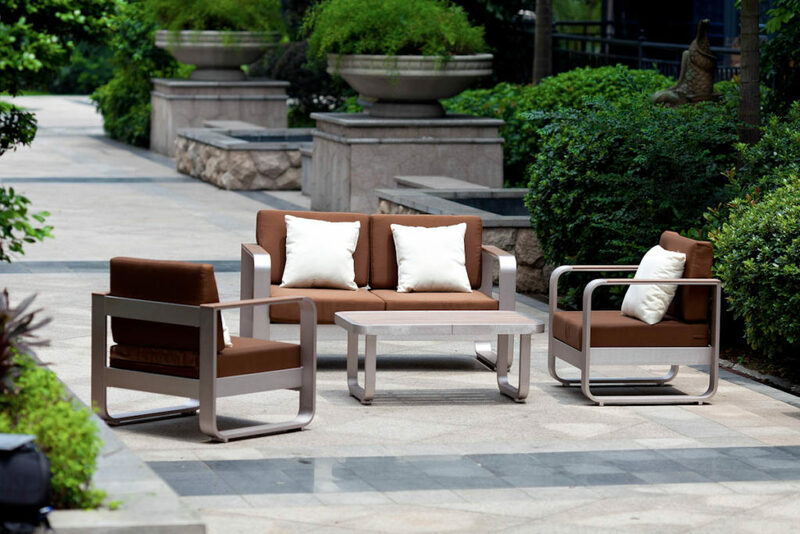 While some patio furniture is undoubtedly made up entirely of either metal or wood, at some point, fabric also comes into play; primarily for comfort seating. Herein, there are many competing interests; with fast-drying foam core enveloped in ‘breathable’ quick-drying mesh-like fabrics that will prevent mildew from setting in after an impromptu summer shower. Of all the manufacturers out there, Sunbrella Fabrics have had the greatest success withstanding the elements of wind, rain and heat; fade-resistant too from the sun, while maintaining a dry, mold-less quality for years to come. Sunbrella originally had its start making sails and other fabric-based accoutrements for marine boats. So, it stood to reason a natural extension of its superiority in this field would eventually trickle down to patio furnishings. Today, you can find versatile Sunbrella Fabrics decorating everything from throw pillows to sofa cushions. So, okay…you have just bought your dream patio set and cannot wait for Mother Nature to get on board with her bounty of nature’s goodness. But wait…how do you arrange your furniture for maximum visual impact and practical application. 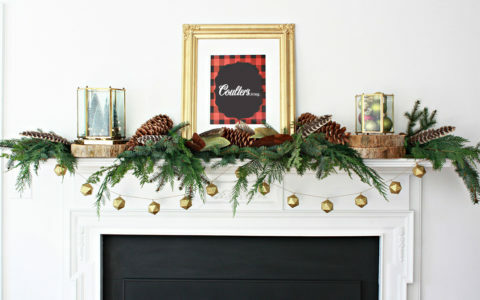 As with interior layouts, it’s always best to begin with a focal point. This is a bit more of a challenge in an outdoor setting, since indoor focal points usually have a wall behind them to visually anchor the space. Symmetry can be your best friend here. Symmetrical designs provide a visual balance. But they can also take on a somewhat more formal look that may be undesirable. By comparison, asymmetrical layouts introduce a relaxed eclecticism to the mix and celebrate your verve for being creative and unusual. Whatever your choice, you will want to ensure your arrangements create a definite flow for foot traffic. 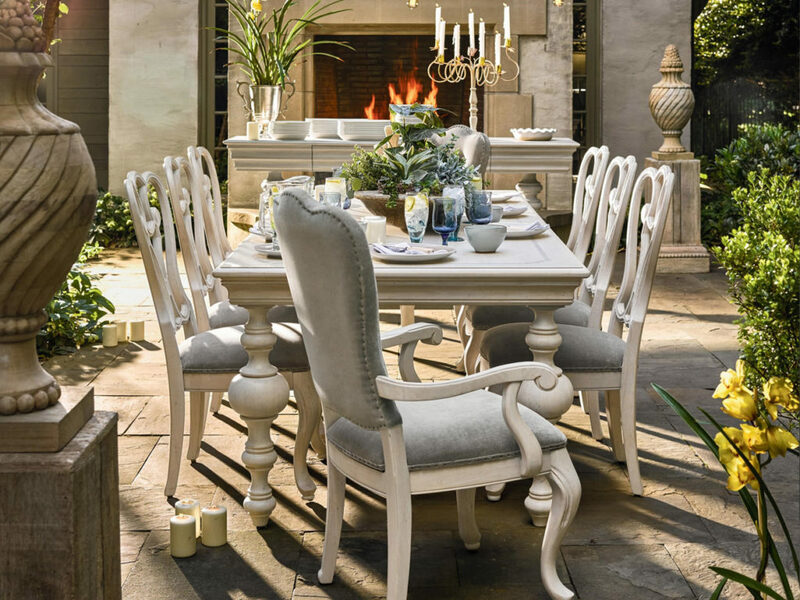 After all, patio furniture is only a portion of your outdoor experience; augmenting courtyards of potted plants, fountains, reflecting and/or swimming pools, statuary, winding paths, rose and herb gardens, wood or metal arbors, and, any other outdoor focal points of interest you can dream up. Therefore, you will want to ensure placement of your furniture creates quiet respites where one can be seated to admire these splendors, but also allows for the passersby to maneuver without bumping into clutter. 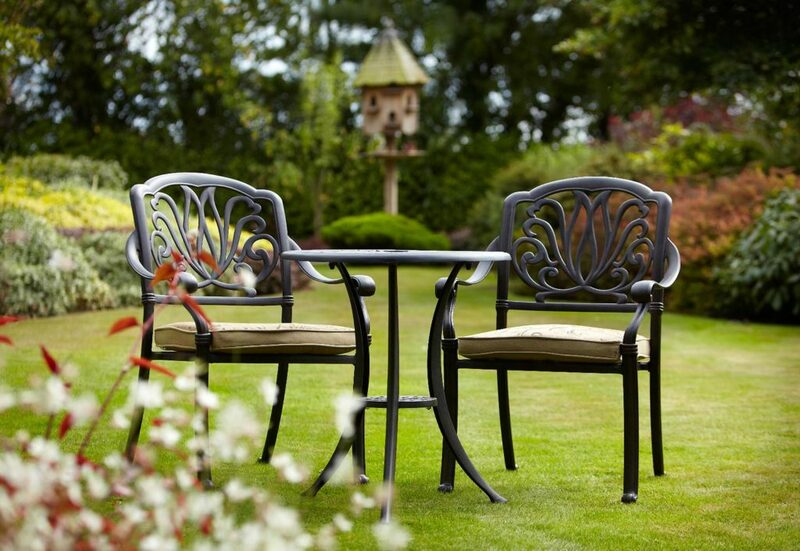 Patio furniture should also be arranged in a way that directs guests around its parameter rather than cutting through it to get to someplace else. Create a park-like setting by adding a nook to your arrangement: placing your longest piece of furniture (say, a sofa or chaise) against a natural barrier, like a flowery berm, stone wall or wooden fence, adding several individual chairs that beckon guests to pull up a seat for some quiet conversation. For those with more space at their disposal, you can truly introduce the feel of a resort to your backyard by creating cul-de-sacs of strategically arranged tables, side tables and ottomans, positioned around a larger centerpiece like a fountain, reflecting and/or swimming pool. The general rule of thumb: allow 45 inches of space for high traffic areas and at least 24 inches for cloistered foot paths that may not have as much. For those with ambitious plans to install an outdoor kitchen; be certain, not only to situate it close to the door of your home (for easy access to the meats, veggies and drinks you will be bringing out shortly), but also to keep the outdoor kitchen slightly separate from the outdoor dining area: not at a great distance, but rather ingeniously situated with a half-wall made of stone, potted planters or perhaps a man-made waterfall that does not isolate the cook from the guests, but creates some breathing space nonetheless. As children are usually a part of your summer outdoor activities, you will want your grill to be located at a safe distance from this entertainment hub. 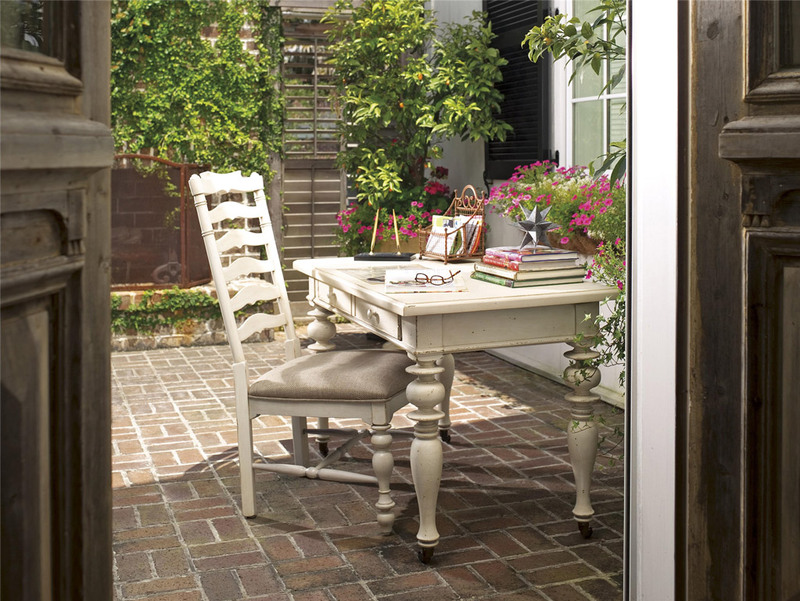 Also, partitioning off your patio space creates a multi-layered experience that is both lively and purposeful. You can position your patio furniture around an outdoor gas or wood-burning fireplace, or perhaps beneath an overhead pergola, with either a solid roof (to keep the elements at bay) or a thatched and/or beamed ceiling, suitable for climbing plants like clematis and wisteria to take hold and create their own startling drama. As with your interior design, the devil is always in the details. So, augment your patio furniture with practical pillows, area rugs, an outdoor ceiling fan and, of course, mood lighting. Today, a good many manufacturers make stylish chandeliers and wall sconces from pliable and practical outdoor materials. Garden lights, either hotwired into your electrical box or solar powered can also create pools of sparkle and shimmer as the sun retires in the late evening. In the final analysis, your patio furniture should be an extension of the personal style and chic good taste you have created inside your home. Aesthetically, your design philosophy when planning an outdoor oasis should seamlessly transition from indoor to outdoor with a sense of gracious living, while celebrating, with coziness and pragmatism, the things you love best about the approaching summer holidays. So, plan ahead and live well. Tan lines, optional.